An inexpensive way of increasing your creativity. 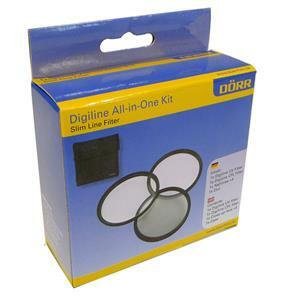 This 43mm filter kit contains 1 UV, Circular Polarizing and Close Up +4 Filter, each of which is invaluable when it comes to perfect photographs. This Dorr 43mm UV slim filter absorbs the ultraviolet rays which often makes outdoor photographs hazy and indistinct. Slim filters stop vignetting and wide angle lenses. A muliti-purpose fine-weather filter for colour, black and white films and Digital. Also serves as a permanent lens protector. The Dorr 43mm slim digi line Circular Polarising filter allows you to remove unwanted reflections from non-metallic surfaces such as water, glass etc. They also enable colour to become more saturated and appear clearer, with better contrast. This effect is often used to increase the contrast and saturation in blue skies and white clouds. The slim mount on this 43mm filter will stop vignetting.